Andrew Carnegie (1835-1919) was a Scottish American industrialist who led the enormous expansion of the American steel industry in the late nineteenth century. He founded Pittsburgh's Carnegie Steel Company, which was later merged with Elbert H. Gary's Federal Steel Company and several smaller companies to create U.S. Steel. With the fortune he made from business among others he built Carnegie Hall, later turning to philanthropy and interests in education, founding the Carnegie Corporation of New York, the Carnegie Endowment for International Peace, the Carnegie Institution of Washington, Carnegie Mellon University, and the Carnegie Museums of Pittsburgh. 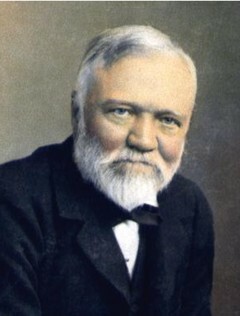 Carnegie gave most of his money to establish libraries, schools, and universities in the United States, the United Kingdom, Canada, and other countries.